The opening scene of Greek director Yorgos Lanthimos’ English language debut welcomes us to an absurd vision of the near future with a woman driving to a field to shoot and kill a donkey. We never see the woman again, but soon enough we understand the likely meaning behind this scene. The film follows David (Colin Farrell), a recently divorced man, as he adjusts to life at a hotel designed to create couples out of single people. The dystopian future presented here requires that all people be in relationships. They’re given around a month to find a compatible person to hook up with, or else they’re turned into an animal of their choosing through means unexplained. Alternatively they can extend their time at the hotel by subduing single people who have attempted to hide in the woods so as to avoid these rules. As absurd as all this sounds I knew almost immediately the world Lanthimos created here was working because I never questioned it. Nevertheless the reason this film is so effective is for the questions it does create. Rather than question the workings of this bizarre world, we start to realize how similar it feels to reality and all the thought provoking questions that fact brings to mind. The people of this world treat the rules as hard and fast things which to break results in painful consequences. We might suggest our real world doesn’t operate in the same way, but it very often does. 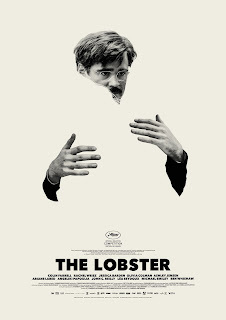 And in case you were wondering why two people wouldn’t just hook up to avoid being turned into animals, Lanthimos establishes how people furiously adhere to the rules more often than not. Society may not force us by pain of physical penalty to find someone to settle down with, but societal expectations can feel very much the same. And like societal expectations personified, the performances here are quiet, subtle, without expression, yet unwavering. That remains a proper description of Lanthimos’ attention to detail and tone throughout this film. The opening scene ends shortly after the woman kills the donkey. The suggestion being, even after her husband was turned into an animal, she hates him enough to want to kill him for good. Yet Lanthimos adds a nice touch by showing another donkey in the same field walk over to investigate the dead donkey almost immediately after it falls to the ground. It indicates a possible relationship between two former humans even after being turned to animals. Even animals need companions. There are many similarly nice little touches throughout this film. There are subtle ones like when David is asked whether he is homosexual or heterosexual. While he pauses to think it over, we hear footsteps that clearly sound like a woman in high heels somewhere off camera. He looks in that direction and answers “heterosexual.” Then there are more noticeable touches like the random animals that start to invade the background of scenes taking place in the woods in the latter half of the film. They are very clearly people from the hotel who failed to find a mate. Lanthimos doesn’t just explore the idea of coupling by using a person who may want to stay single. He knows life is more complicated than that. David’s need of companionship is referenced in a subtle way throughout the film. There is a place on his back that he simply can’t reach to rub a cream on it. Only after meeting the right person does that fairly intimate act get performed by another person. Lanthimos also seems to be making a point that a person cannot find true love until they stop looking for it. David spends the first half of the film in a hotel where he is supposed to find a mate but can't. The need of a companion is reinforced by comical little sketches performed by hotel staff showing a man sitting at a dinner table choking to death on his supper. When they repeat the scene with a woman sitting across from him, she is able to save his life. Yet as we know, rarely is true love found when we’re desperately searching for it. So David flees the hotel and takes up with a group of outsiders living in the woods. These outsiders are known as loners and their leader (Léa Seydoux) imposes harsh rules on them. To be a loner is to be single and thus any hint of flirting or courtship is met with painful penalties. It’s the exact opposite of life at the hotel. As ironic as it may seem, it does in some way feel like real life that while David has accepted his single life, he would find the perfect companion. Rachel Weisz plays her with similar subtlety, yet much like Colin Farrell’s performance, there is a hint of complexity. We can tell by looking in their eyes there is something more going on underneath their forced expressionless exterior. While there are some genuinely romantic moments for this couple, it’s clear we’re meant to question this society’s representation of a compatible couple. Compatibility seems to be based on shallow things like whether two people are nearsighted, or whether or not they both walk with a limp or suffer from nosebleeds. Yet the second we start to question that logic, we realize the necessity of having people who understand us and can empathize with us. The fact adds another layer to the betrayal when the truth comes out that one member of a couple was lying in order to avoid being turned into an animal. Yet that act of betrayal is itself an act of animal instinct for the sake of survival. Lanthimos is able to pack this film full of these thought provoking moments. As someone who went to a college where the phrase “ring by spring” was quoted whenever another couple formed in their senior year (as if that is the last best chance to find love), this film felt like borderline parody of people in their 20’s to early 30’s. The indication being, the older you get the more lonely you become and more pressure you feel to find companionship. But what is it that drives this need? Are the methods used here any more or less effective? However, I’d be remiss if I didn’t mention how genuinely funny this film is. There aren’t punchlines, or jokes, or big moments. It’s all deadpan. You won’t laugh out loud, but it is funny nonetheless. However I’d also be remiss if I failed to mention the way the last third of the film, uncharacteristically loses its way. For a film that feels fairly tight, snappy and well paced in its first half, the latter half begins to waver and meander in a way that feels far less engaging. It’s about the only things holding this film back from being a truly great film. Nevertheless there is undeniable precision with which Lanthimos approaches his story and the compositions with which he shoots it all. As such it is a very good film that feels like the workings of a great director.